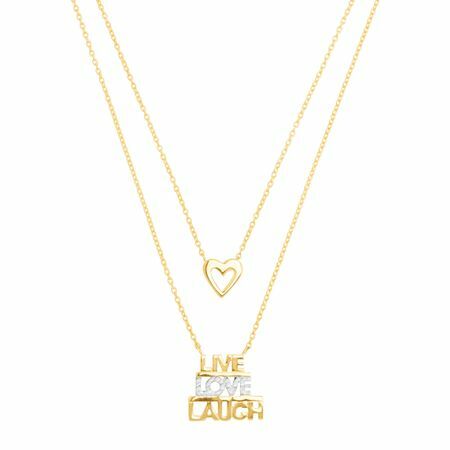 If your motto in life is 'Live, Love, and Laugh' then you're going to love this adorable gold necklace. Perfect for the Valentine's Day spirit to bring love and laughter into your life. Also makes a great gift for a gal pal or a special someone! Featuring a layered design with a dainty heart and a quote plate reading 'Live, Love, Laugh,' this 10K gold necklace gets a two-tone look with a rhodium-plated 'love' print. Feature pieces measure 1/2 by 9/16 inches and 5/16 by 5/16 inches with a total length of 17 inches.